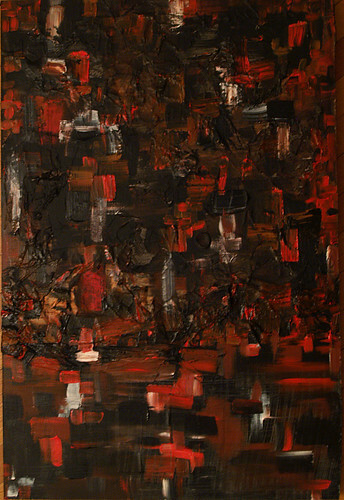 New Painting: Reflections 2009 — I’ll start 2010 with good intentions to post here more often. Despite my best efforts I was unable to keep a consistent flow of ideas in 2009. Perhaps this painting is an appropriate image to start with. Reflections 2009 is a piece I struggled with over the summer and fall. It began as an anthropological examination of what you might find if you took a slice of the earth at the horizon line. I started out with newspaper pages attached to the board with several coats of gel medium. I gradually built up layers of paint, both washes and opaque colour. During different epochs found objects were attached to the board, then later removed leaving behind remnants of their presences. Sections were scraped down to the original board. More colour and texture were added. 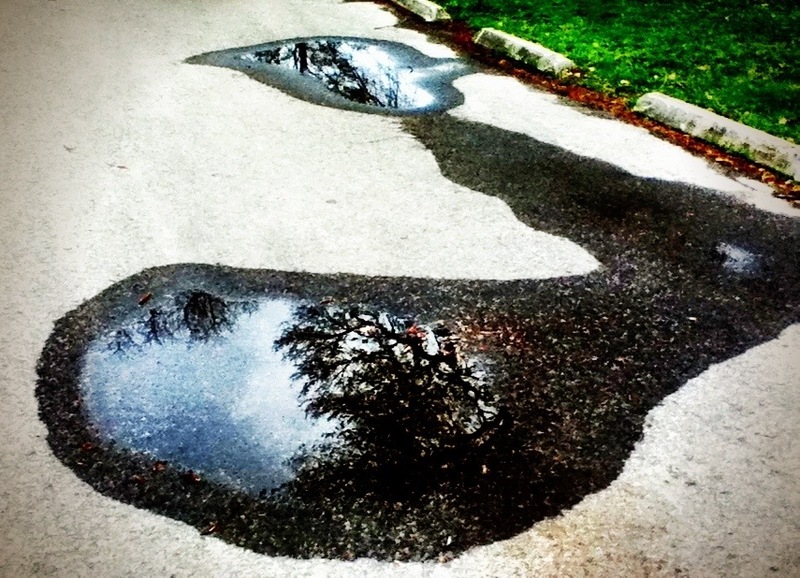 The breakthrough came when things got turned upside down — the bottom became the top and the top was transformed from sky to shimmery echo of the textured other two-thirds. In the end it is a much darker piece than I anticipated, but only now, after emerging for a tumultuous year, I recongize this is a more satisfiying representation of the my original intention. It amazes me how proximity to great art inspires, perhaps requires one to respond, to dig deep, to examine one’s own emotions and motivations for making art. I found myself in such an introspective mood this past weekend after reading Toronto Globe and Mail visual arts columnist Gary Michael Dault’s remarks about Kitchener, ON based painter Melissa Doherty’s four-piece show at Toronto’s Edward Day Gallery. 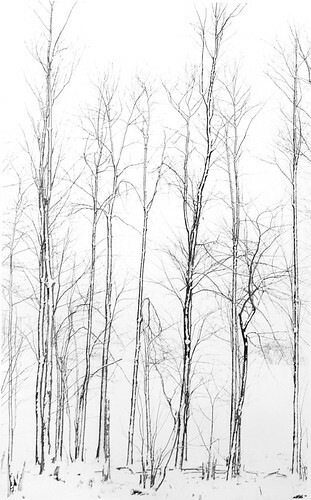 My musing led me to the image above, made in the pre-digital era on a mild winter day when the wet, blowing snow was sticking to the trunks of trees creating an etched effect. I dug out an honest-to-goodness, black and white, silver print I made at the time. I copied it with my camera because it was too big for the scanner bed. I find the trees that demarcate the line where farm fields merge of particular visual interest and in their leafless skeletal form they are even more appealing. This second image also came to mind. 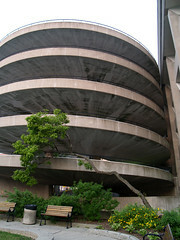 The graceful curving trunk of this tenacious specimen opposes the spiral of the parking structure. 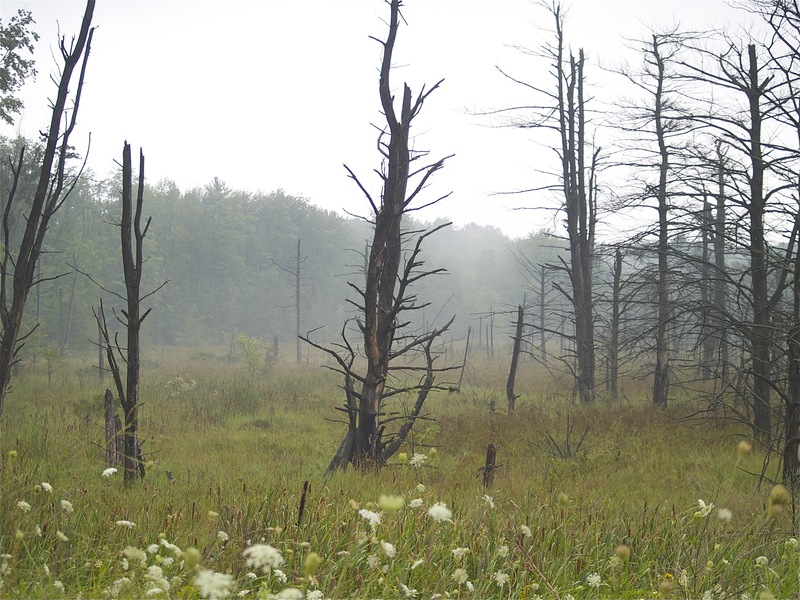 Despite its beauty and placement, this trees was cut down shortly after this photo was taken in May 2007. So, I humbly respond to the greatness of Melissa Doherty’s paintings. I can feel the cold seeping into my feet through the soles of my boots as I stand in a snowbank in Bancorft, Ontario. 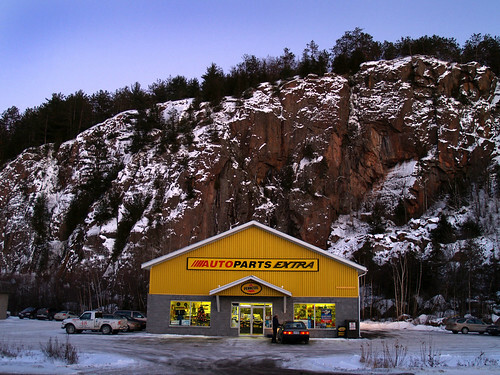 The store is surprisingly inviting and cozy with the rock face looming just behind it, but its jaundiced presence – literal and figurative – puts me on guard. Which will win rocks or cars? 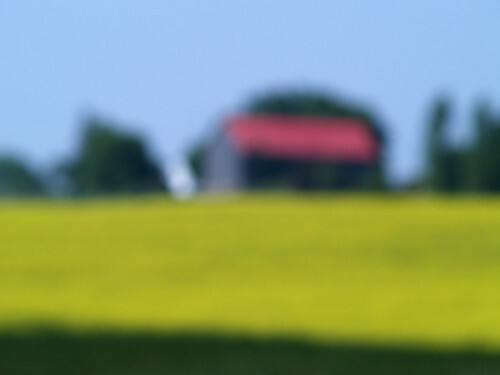 What if the intention of the camera was to capture colour and form rather than replicate three dimensional objects on a two dimensional medium? This set of images is what I think it might look like if we changed the camera’s character. I’ve been intentionally making images out of focus for some time now and I’m outing myself with this post. It clearly does work for everything, but in some situations I find the colour-and-form images evoke a deeper emotional response than a sharply focused one. It frees the mind to explore and seek out a personal narrative for the piece. Click on the photo on the right to see more colour and form.